i had chinese takeout twice last week (shhh..). 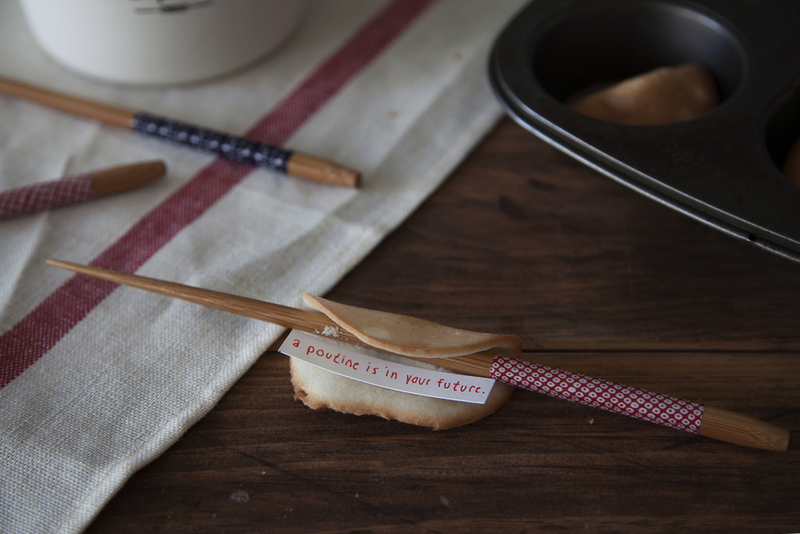 when i finished my meal & cracked open the fortune cookie i thought to myself "o.m.g i could totally make these!" & here we are. 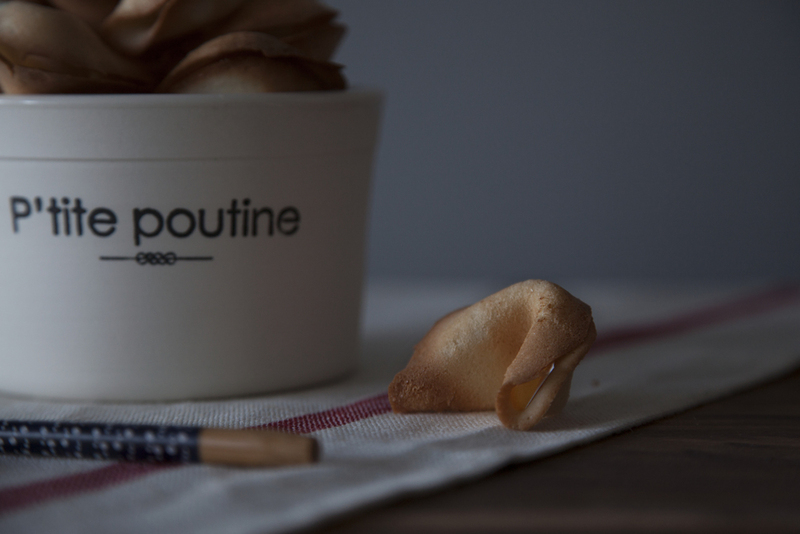 i thought they would be difficult to shape as good as the actual take-out ones, but they ended up being pretty easy (plus taste a lot better then sweet flavoured cardboard). complete with much funnier fortunes than the wise chinese sayings. i think these would be so perfect for a dinner party or any type of party for that matter. it makes me want to host something, just so i can make them. i highly reccomend using a silpat, or a similar silicon batter as it can be difficult to peel them off the baking tray as quickly as needed. 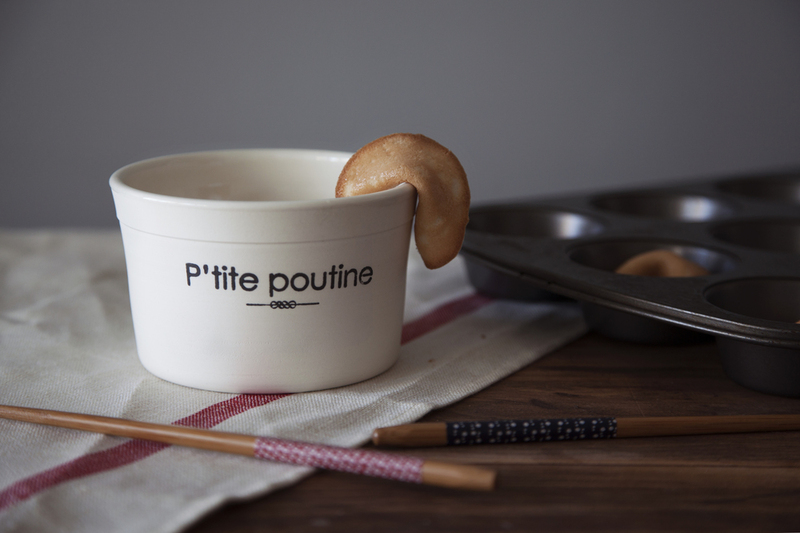 i would also like to point out the fact that i used a poutine bowl. it is new favourite cermaic bowl made by hugo didier & i will put ANYTHING i can in it. in a mixing bowl whisk egg whites, flour, sugar, vanilla, water & salt until a smooth batter is formed. on a silpat pour a tablespoon of batter and spread into a thin 4-inch circle. bake about 2-4 cookies per sheet, depending how fast you can move once they come out. bake for 6 minutes, until the edges begin to brown. remove from oven and within the first 60 seconds fold each cookie. 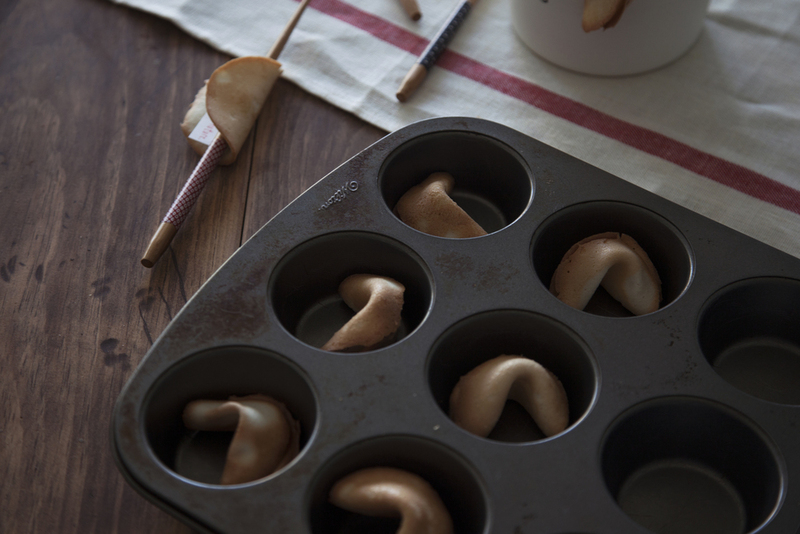 to fold into shape, fold each cookie in half with the fortune inside and using a bowl bend the edges together. place in muffin tin until the cookie hardens into shape. repeat this for the remainder of the batter.